Master your Files! Compact an amazing 1600 3-mil documents in one easily accessible unit. Effortlessly retrieve one or multiple sheets without having to stoop or bend. Each document is attached to self-adhesive, prepunched carrier strips (order separately) and hung vertically from pins and posts on sturdy 6-1/2" centers, eliminating unsightly fingerprint smudges and dog-eared corners. Safco MasterFiles are constructed of insulated double wall steel and include a keyed lock. MasterFile lids are equipped with gas cylinders to assist in raising and prevent accidental closure. All files come complete with a limited lifetime warranty. * Free shipping with commercial curbside delivery only available within the Continental United States. Additional trucking charges for residential delivery, inside delivery, or lift-gate services may be applicable. 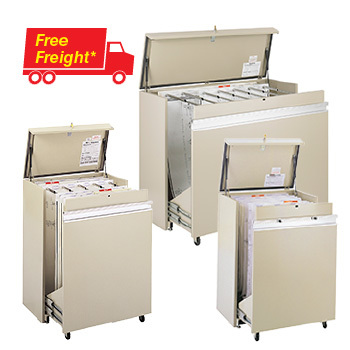 Freight service paperwork will be emailed or faxed - customer signature is required before item ships.